We deep clean like you've never seen! You don't need a cleaning arsenal... You need Cleaning Chicks! You don't want "okay"...you want SHINY! The Cleaning Chicks are based in Alberton, but provide cleaning services all over Johannesburg and surrounds including Midrand. We offer home and office cleaning services. If you’re looking for a Johannesburg House Cleaning Company , we’re the Chicks for you. Moving is very stressful, thus the last thing you want to have to worry about after packing for days on end is cleaning the house. Nor do you want to have to clean the new one you are moving into. You simply want to get unpacked and settled in with as little chaos as possible. Well, that’s where we come in! Our cleaners will make sure your old home is shiny for the new occupants and scrub away the past in your new home. Cleaning Chicks, in association with Girls on the Move, specialize in pre- and post-occupation cleaning. We’ll assist in making your move less stressful and making the transition into your new home an easy one! All cleaning jobs are supervised and you can, therefore, feel calm that all is under control. Our cleaners will take care of it all, hence, you can put your feet up and plan your cupboard space. 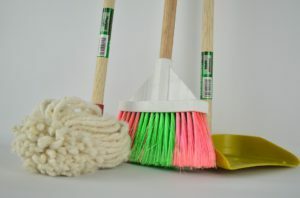 Services – What exactly do our cleaners do? Johannesburg clients want a home that you can be proud of, but deep cleaning your home can be such a drag. Why not get the Cleaning Chicks in to make sure your home is sparkly clean and treat yourself to a spa day, instead? Us Cleaning Chicks will take care of everything! Clean floors, clean cupboards on the inside and outside, clean windows, clean bathrooms, shiny clean kitchens and we’ll even clean out that garage that freaks you out. A team of cleaning ladies will take care of it all in one day, which means you have one less chore to worry about. Cleaner is better. Deep clean is our specialty! No mess, no fuss, no backache!